Why so Many Plane Crashes? One would think that with the advancement of technology, it would be much safer to travel by air. For the most part, this seems to be true but over a period of just a few months, from late 2014 into this year, several plane crashes occurred. This caused several persons to be afraid to travel by air. Although the causes may differ, it is a cause for concern. From the mysterious Malaysian airplane that went missing and made headlines to the small air crafts that crashed, the number of plane crashes seem to have been increasing. It is so unfortunate that most times all the passengers die which makes it more scary. What could be the cause of so many crashes? Are airplane passengers totally helpless? The data suggests that flying today is safer than ever. According to safety analysts Ascend, 2014 was the safest year since 1945, with just one fatal accident per 2.38 million flights, as compared to every 1.91 million flights in 2013. Although it should be noted that this data did not include the loss of the Malaysian airplane over Ukraine, which they count as a war loss rather than an accident. This BBC article has more on the reasons why flying is now safer than ever; namely, improved technology and learning from past mistakes/accidents. Image Copyright: Aviation Safety Network. As we can see, there is a distinct decline despite there being more flights than ever today. This CNN article has a whole lot more information that is worthy of a read through. It certainly helps to explain why, despite these recent incidents, flying is safer than ever. Last year it seemed like a bunch of planes either disappeared or crashed in quick succession. But I think it only seems like that for three reasons: 1) we hear about a big story like the Malaysian flight and suddenly it's hip for news outlets to report on anything to do with plane crashes anywhere in the world; 2) global media means we're more aware of plane crashes and disappearances happening anywhere in the world; and 3) larger planes means more passengers, which means more fatalities and injuries per crash. So the amount of crashes can go down while the amount of people getting hurt can remain steady or even increase. I'd research this last point, but I have a feeling that linkmaster dillinger10 could have references up faster than I could think of the right keywords to Google. Also, I'm exhausted, and I don't think I could parse search results right now. Hopefully, the image below is what you were looking for. 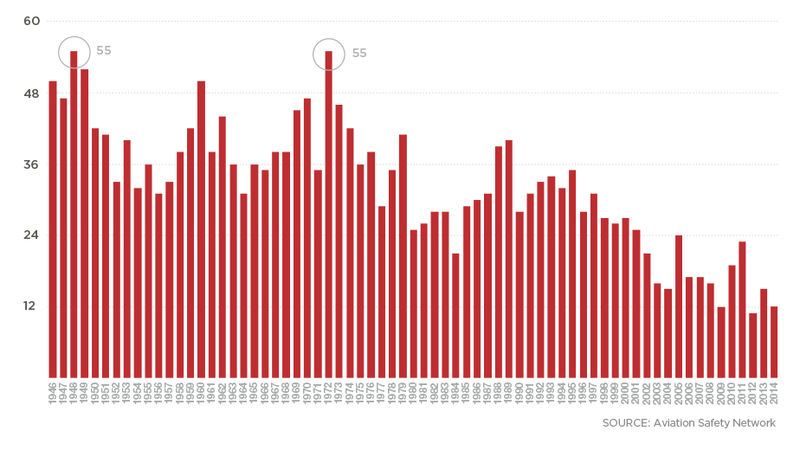 The graphic shows the number of commercial aviation deaths per year since 1946. As we can see, 2013 was the safest year in aviation since 1945 with 265 deaths. Last year there were 761 deaths. 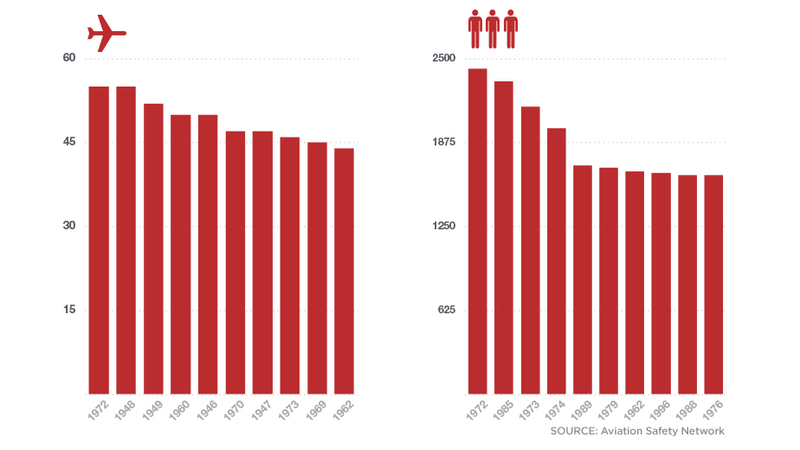 The number of deaths per year have been on the decline since the 1970s. Below is one additional graphic which provides a little more context, showing the ten worst years for crashes and deaths. As the chart above shows, it was common for worldwide aviation accidents to top 1,000 deaths a year. 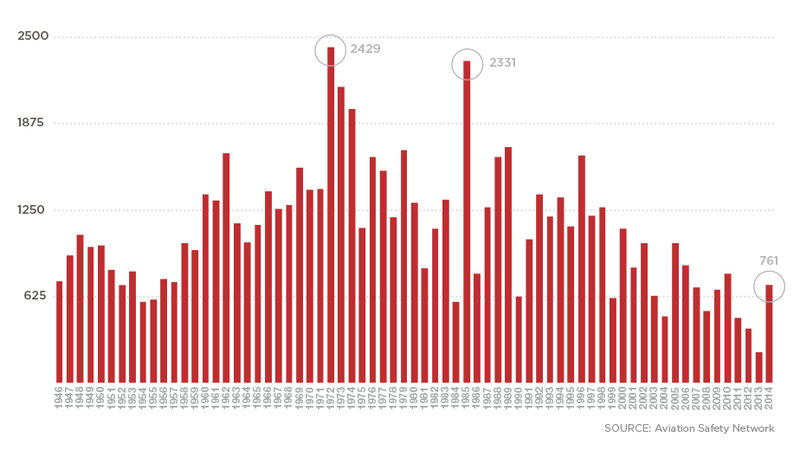 The worst crash year on record  1972  also had the most deaths: 2,429. The deadliest aviation accident in history didn't even occur in any of the top 10 years. In 1977, two Boeing 747s collided on a runway on the Spanish island of Tenerife, killing 583. For comparison, the safest years since 1946 have 11 to 21 accidents per year and 224 to 627 annual deaths. I think that these days there is a lot of paranoia, and justifiably so, about possible terrorist attacks. Every plane that crashes is immediately put into the spotlight and linked to possible terrorist activities. It seems to me that in the past, plane crashes were rather regarded as sad statistics instead of possible triggers for new political unrest or even civil wars. To me it seems that, due to the shift of focus, it looks like there are more planes crashing these days than in the past. And my assumptions might be right if you look at the above statistics by dillinger10, which indicate that air travel is safer these days than ever. Same as what others posted, I think the media today has been really focused on exposing plane crashes. So it actually seems like there are a lot of crashes when in reality, most cases are just brought into public. Before, news programs are not that extensive and certain incidents like plane crashes may not reach the news bulletin because of geographical distance. Now, with technology, even far away countries plane crashes can be known worldwide. This is thanks to technology and media. I do think it is safer to fly nowadays. We are in the era of modernity and technological advancement. Even gadgets are upgraded every year and I would think airplanes get the same treatment. It is just sometimes, media hypes up certain small issues and link it to terrorism or hate crimes. Though there are of course times that some crashes are really because of terrorism but not all of them. I knew you'd come through for me. See, I believed in you, and my wish came true. Well! So much for that theory. I guess it's just our skewed perceptions and media hype, then. We tend to have inaccurate views of the past. Reminds me of how people are so quick to say that society is getting dumber, when literacy rates are actually rising. Plane crashes have also most likely become an extra meaty subject for the media since 9/11. That might sound a little ethnocentric, but the U.S. does control a hefty amount of global media. If we're obsessed with it, we kind of force the rest of the world to be, too. I also think a large part of the perception is due to today's 24/7 media. 30 years ago, we consumed the majority of our news through newspapers, TV and radio, and not every single plane crash received the type of attention it receives today. Given the digital age we live in, every plane crash is reported and analyzed with great detail and depth. ASurvivor and fcphdJim like this. I also think a large part of the perception is due to today's 24/7 media. ^ This. With cable news, the Internet, etc., they are always trying to fill that 24-hour news cycle as fast as they can. Many disasters are very much news worth, but at times the cable news sources rehash it to death. Cars and motorcycles are actually more dangerous than Airplanes. Airplane crashes always makes the news because it rarely happens compared to road accidents that happens every day and every night. In fact there are Airlines that never experienced a single crash on its history. Why do you think Billionaires prefers private jets and Helicopters over land vehicles? They know they have a higher safety rate on air. Yes accidents happened and ssometimes. Yes this is very tragic but cars , trucks and buses killed more people. Last edited by Billy; 08-11-2015, 04:06 AM. Cars and motorcycles are actually more dangerous than Airplanes. Airplane crashes always makes the news because it rarely happens compared to road accidents that happens every day and every night. In fact there are Airlines that never experienced a single crash on its history. Why do you think Billionaires prefers private jets and Helicopters over land vehicles? They know they have a higher safety rate on air. Yes accidents happened and sometimes I this very tragic but cars , trucks and buses killed more people. That is a great observation regarding plane crashes in relation to other modes of transportation. Given that plane crashes happen at a much lower rate than cars and trains, they do indeed receive much greater news coverage simply because of the rarity of such an event. There aren't enough hours in a day to report every single car, truck, train and bus accident that occurs throughout the world on a daily basis. My strongest belief when these things occur is money is the reason. In the past things were built strong but now.... everything is built cheaply to save money. This causes for more problems such as parts breaking and such. Cut backs can cause a lot of issues. Not to mention, many company's now outsource to foreign countries. So the quality of the parts is not where they should be. Everyone needs to look at individual airline maintenance. I know a person that use to do safety inspections on airplanes at different airports. Not to sure what the name of position was, but for now let's just say that it was his opinion that made it possible for airlines to start using that airport as part of it's service areas. He goes on to say that there are several airlines that in bad shape mechanical wise that the airport in general would deny them access and terminal privileges because they their planes did not meet a certain standard. Do a search for most break downs and crash of all airlines, you'll see what I mean. He also goes on to say that there are a few airlines he refuses to use til this day. I don't think plane crashes are more frequent than before, but you might believe that since a lot of them have been broadcasted on the internet or TV because they were related to the war that's going between Ukraine and Russia. I think that flights are much safer than before, as dillinger10 's photos are showing.